After missing the last two games with an ankle injury, NT B.J. 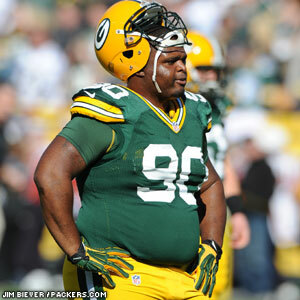 Raji didn’t practice on Friday but is listed as probable on the final injury report for Sunday’s game. Raji practiced in full pads on Thursday and appears on track to play. Meanwhile, WR Jordy Nelson is scheduled to test his hamstring injury on Sunday morning and he’ll be a game-time decision. He’s listed as questionable. FB John Kuhn has been ruled out with his hamstring injury. All the other players on the injury report who practiced this week are listed as probable. That includes RB James Starks, who missed Thursday’s practice with an illness but returned on a limited basis Friday. LB Nick Perry and CB Sam Shields did not practice all week and have been ruled out. If Nelson is unable to play, it could open the door for WR Jarrett Boykin to get some significant snaps. Boykin has played only a handful of snaps so far this season after being inactive on gameday for the first five weeks. Ironically, Boykin’s first major action could come against Jacksonville, a team that cut him in the spring, which led to him getting a tryout with the Packers. –LS Brett Goode has signed a long-term contract extension, which puts all three of the Packers’ specialists (K Mason Crosby, P Tim Masthay and Goode) under contract for the foreseeable future. Goode joined the team in 2008, one year after Crosby and two years before Masthay. “You look at the battery, punter, kicker and snapper, that’s a very important group,” McCarthy said. “They spend most of their time together. The personality of the three guys is very important. They lean on one another, they help correct one another. I think they’re very honest as far as their time together professionally and personally. They’re a good group. –McCarthy said neither LB Frank Zombo nor TE Andrew Quarless would be activated from PUP for Sunday’s game. Both players have been practicing for the last two weeks, and they have one week left before a decision has to be made to either activate them, release them, or place them on injured reserve for the season. McCarthy made it sound as though Zombo is the closest to being game-ready. He said Quarless is still experiencing some “soreness” in his surgically repaired knee, which is normal in the recovery process. The other player on PUP, T Derek Sherrod, is still not ready to practice and could be headed to IR for the season.